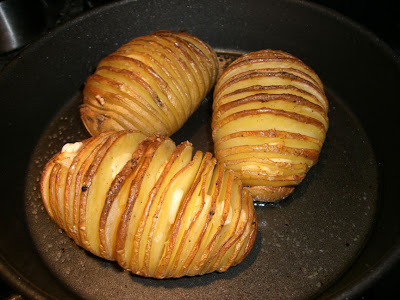 I imagine that the Hasselback potato recipe at SeaSaltWithFood gets a lot of traffic. Why wouldn't it? The photo of a thinly sliced but still intact potato, golden and crispy, draws the stomach's eye in instantly. A quick read shows that not only is the presentation striking, the recipe is easy as can be. I couldn't resist. My version is nearly identical but adds a little cayenne pepper because I live in Louisiana and Kid Cayenne is a bonafide Cajun, so that's just how we roll. Take each potato, in this case I used Yukon Gold, and make thin slices in it without cutting all the way through, as evenly spaced as you can manage. Helpful tricks include placing the potato in a wooden spoon or setting it between two chopsticks as you cut. 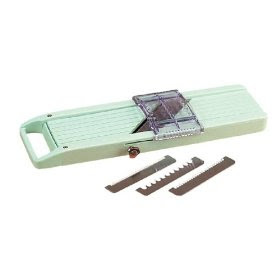 This provides a guide that prevents you from cutting through the potato. I found it easier than I thought it would be not to cut through. I went about 2/3rds of the way through the potatoes using a very sharp chef's knife. I tried the spoon trick and found it easier to just do it by hand, but your mileage may vary. Once you have cut the potato, slide thin slices of garlic clove between each slit of potato. You can put less garlic if you like. You can put no garlic if you like. The garlic only affects the flavor of the potato, not the way it will cook. Place potatoes in a baking pan and drizzle with olive oil. Season with salt and pepper and a very light sprinkle of cayenne. 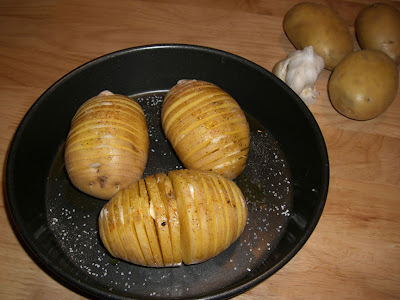 Bake in oven for approximately 45 minutes for medium sized potatoes. Finished potatoes should be soft enough to slide a fork through on the inside, but golden and crispy on the outside. Dot with a bit of butter at the end, if you like. They are delicious and adorable. 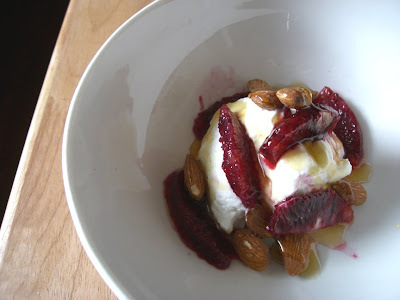 Fage Greek yogurt, jeweled blood orange, raw almonds, honey. 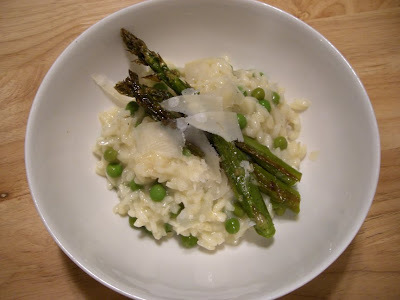 ...so I made a simple pea risotto with a touch of lemon, roasted some asparagus to put on top and covered the whole thing with thick shavings of Parmesan Reggiano. First, get your stock into a spare saucepan and heat it to a simmer on a spare stove burner. You will need this to be warm later. Add olive oil to a heavy bottomed medium pan (I used a dutch oven but any sauce pan with good heat distribution will do) over medium heat. When hot, add shallot and garlic. Saute until soft. Add the rice and stir gently until every grain is covered in oil and they begin to go translucent. Add wine and stir in until absorbed. Now, begin adding your chicken stock in increments. I add two or 3 small ladles at at time and stir gently until the rice absorbs it, then add more. Continue to add the stock for as long as the rice will continue to absorb it. Taste occasionally for texture. When the rice is beginning to get soft enough to eat, add the peas and lemon juice and zest. Continue to cook until risotto is the texture you desire. If you run out of stock before the rice is finished being thirsty, add small amounts of boiling water to supplement it. When risotto is softly al dente, add butter and parmesan and season to taste with salt and pepper. Top with a generous portion of shaved Parmesan and a side of roasted asparagus. Place asparagus on a baking pan. Drizzle with olive oil and roll to coat all sides of the asparagus with oil. Season with kosher or sea salt. Place in oven for 8-12 minutes or until they are starting to caramelize lightly. Remove from oven and sprinkle with lemon juice and Parmesan Reggiano. 1. It only takes 11 minutes to get to 9 Roses from my house if there is no traffic on or around the bridge. The same cannot necessarily be said for the return. Darned toll bridge. 2. 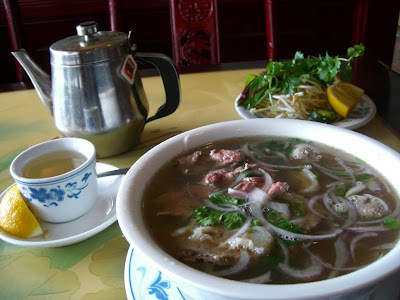 9 Roses has combination pho with sliced flank, meatballs and tendon. It's pretty good, but somehow not quite as good as I imagined it would be. The broth could be better... could have deeper flavor. 3. Same with the chao vit (duck rice porridge). It was good but not great. I was a bit disappointed. The last time I went to Hoa Hong, it was a remarkably great meal though, so I may just have been off myself. My sinuses were terrible and could have been affecting my taste buds. I'll try again soon and see if I can provide a better perspective. I wanted a salad spinner for years but thought it was a one function item and a frivolous purchase, so I resisted buying one. Finally, a couple of years ago, the longing for properly dried romaine grew too intense and I broke down and got a nice Oxo Good Grips Spinner. I have never regretted it. After a quick soak in ice water and a whirl through the spinner, my salad greens are always crisp, fresh and lovely. My dressing always adheres. My herbs are clean and dry. I use the big acrylic bowl for (of course) salad, as well as chips, popcorn, large cold dishes, etc. I sometimes use the inner strainer as a colander. Salad spinner is not a frivolous item, in fact it has become something that I use several times a week for a number of purposes. I was happily wrong. Maybe you could weigh in. Do any of you own these or similar items and do you think they are worth having if one is on a tight budget and has a small kitchen? 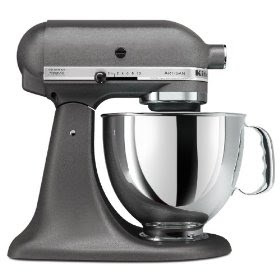 Stand Mixer: I have a small, inexpensive hand mixer, but I covet the KitchenAid Artisan stand mixer. Aside from being very expensive, they are also huge, heavy and would take up a lot of prime counter space in my small kitchen. I love to bake, but don't do it as often as I would like to because of my ever expanding waistline. I want to be able to make homemade marshmallows and various other things that take more power than my hand mixer can manage, but... will I do it enough to justify? I don't want an expensive piece of kitchen eye candy. Who has a stand mixer, and how often do you use it? Fancy Rice Cooker: Everyone in Louisiana should own a rice cooker, right? Except that I make lovely rice on the stove and since I am usually cooking for just two, rarely need to make more than 2 cups at a time. 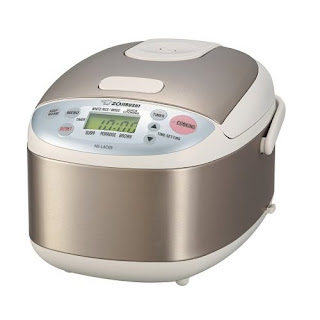 This Japanese beauty, the Zojirushi Micom 3-Cup Rice Cooker and Warmer, is expensive at about $125. but the reviews are excellent and a friend, who knows about such things, highly recommends the brand. It has a rice porridge setting. 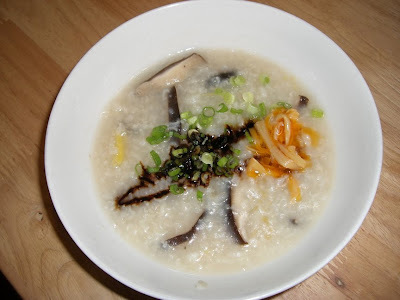 If you haven't noticed from previous blog posts, I'm a little obsessed with rice porridge. I already own a very simple rice cooker which I only break out of the pantry for times when I have company. Do I need to splurge on a fancier version? Probably not, but I can't help but want to. Hot Water Dispensing Pot: I work from home and drink French pressed coffee in the mornings and green tea in the afternoons. I also use boiling water for miso soup packets and endless other things. Each time, I fill the kettle and wait for it to boil on the stove top. When making tea and coffee, I keep an ear perked from the next room hoping to hear and catch it in that moment just before it actually boils, just before it's ready to whistle, so I can avoid scalding the coffee grinds and tea leaves. 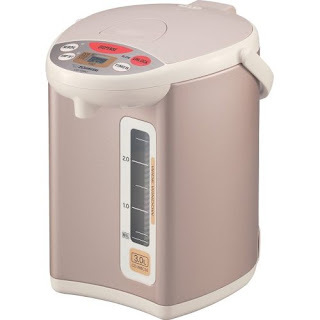 I would love to have a dispensing pot such as this one from Zojirushi, that can heat water to a variety of temperatures (140, 175, 195, and 208 degrees F) and keep it there, at the ready, for me to have a nice cup of whatever at any given moment. It seems that it would also be useful when cooking (starting off boiled eggs, supplementing stock when in the last stages of risotto making, thinning a sauce, etc). But again... expensive (about $90) and requires counter space. Worth it? I am strongly compelled to say yes, but then I think... what's the big deal? So I have to wait a few minutes for the kettle to boil? How am I in such a big hurry that I can't wait on a kettle? I'm really not. Anyone have an opinion on this? Mandolin: I chop vegetables nearly every day. I like chopping. It is meditative and calming. I take pleasure in learning to use my knife as an extension of my hand. However. Chopping many vegetables is sometimes tedious and takes too long, and makes a meal that I'd like to have on the table in 35 minutes take much longer if there are many ingredients involved. Mandolins are precise and quick (and scary). They can do things that I can't really do by hand. While there are well-reviewed, inexpensive Japanese mandolins like this one from Kyocera available, I still hesitate to buy one. I don't want it to take up valuable drawer space, gathering dust as I continue my love affair with my chef's knife. Anyone have one, and do you put it to good use? Madeleine Sheets: This one really is frivolous, I think. I love madeleines and I know they are easy and most delicious when freshly baked. I have read up on madeleine sheet pans and hear over and over again that it's the metal pans that do the best job. Only problem is... do I really want to spend $20 on something that I absolutely cannot use for anything else? I want so badly to bake Chez Pim's bergamot madeleines. I'm just plain aching for them. 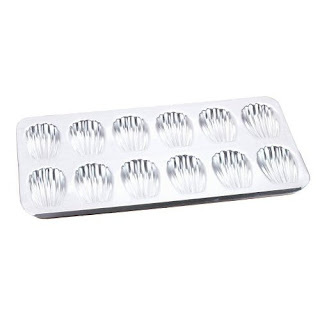 Will I bake madeleines 2 or 3 times and then let the pan sit unused in the back of my cabinet? This is a question that only I can answer for myself, I know. *sigh* I'll let you know if I ever decide to go for it. Your thoughts are welcomed. What items are on your kitchen wishlist? Well, my camera has broken, which is very disappointing. Because of that, I feel I cannot blog. Yes, I am excellent at excuses. We used Kid Cayenne's Blackberry for these (rather poor) photos. 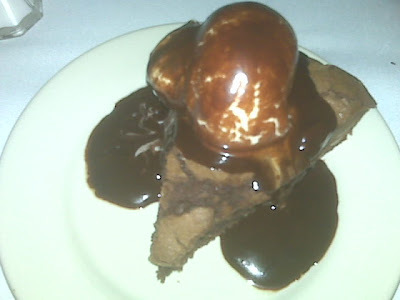 Last week, we ate at Clancy's for the first time. It was nice, though very traditional and hmm, a bit boring. 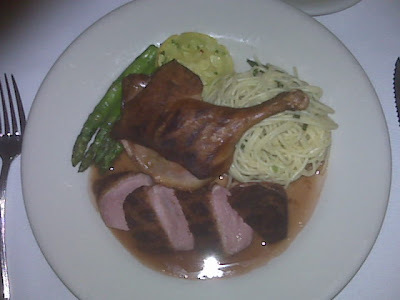 I had the house smoked duck, which I thought was awesome and possibly the most tasty duck I've ever eaten. Unfortunately, it was served with only a few slices of squash, asparagus and a bit of slightly overcooked pasta with butter and herb. Kid Cayenne had a filet mignon with bernaise sauce, which came with fried potatoes and asparagus. Nothing to write home about. The desserts were actually quite nice. 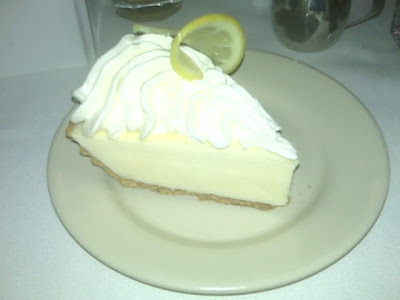 I had a lemon icebox cake which was perfectly tart and lovely. I could really go for another slice of that at any given moment. Kid had a really, really good brownie a la mode. All in all, Clancy's seems like a good place for a comforting weeknight dinner. It has that wonderful Uptown neighborhood feel. It is pricey but the service is excellent and the atmosphere is comfortable and inviting. Expect to be looked after very well and to feel at home. Expect to eat a good meal. Don't expect it to be excellent or very interesting. Bring water, rice and ginger to a boil then reduce heat and simmer for as long as it takes for the rice to break down into a porridge. This can take an hour or so... sometimes longer if you have the heat very low. It will go a bit faster with a medium heat but you have to keep an eye on the water level and not let it cook down too much. You can do it overnight, in a slow cooker, if you wish. Some rice cookers also have congee settings. I just do it in a saucepan and let it cook all morning, letting it finish up in time for a late breakfast. Once the porridge is at a thick, creamy consistency, add the sliced mushroom and let cook a few minute longer until mushrooms are warmed through. Remove from heat and ladle into bowl. Add chopped green onion, pickled bamboo shoot and soy sauce to taste. A bit of freshly ground black pepper is good too.... If you don't have pickled bamboo shoot, make it anyway. It's still delicious. This recipe makes 2 moderate servings or one generous one. Pour half the can of coconut milk into the pan, bring to a boil. Add green curry paste and stir into the coconut milk for about 2 minutes. Add chicken and simmer until cooked through. Add carrots and simmer for a minute or two (none of my other vegetables looked like they needed any additional cooking time), then add all other vegetables and cook for a few minutes. Add remaining coconut milk, fish sauce and sugar. Cook until vegetables are tender crisp. Serve with rice. This served 2 with plenty for leftovers. The result was very good, but HOLY WOW SPICY! I mean, we ate it anyway so it wasn't inedibley spicy but WOW! TOO MUCH CURRY PASTE! I think next time, I will do things exactly the same, but use 2 TB curry paste instead of 3. 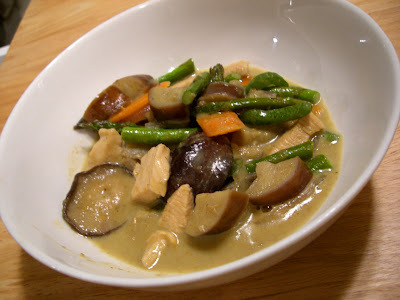 Better yet, maybe some of you Thai curry experts out there can tell me what you would have done differently. Suggestions are appreciated. P.S. I was really disappointed, last night, to learn that Whole Foods on Magazine doesn't carry Thai basil. I wanted to include it but did't have time to go to another store. Next time I make this, I'll probably shop at Hong Kong Market for vegetables instead.